SOUTH CHINA SEA - The U.S. Navy's forward-deployed aircraft carrier USS George Washington (CVN 73) hosted Malaysian distinguished visitors to see at-sea operations, Oct. 23. The tour familiarized George Washington's Malaysian partners in flight operations, launch and recovery of aircraft, aircraft maintenance and ship navigation. "[Today's tour] was very exciting," said Mr. Shakib Ahmad Shakir, deputy under sect., Malaysian Defense Ministry (MINDEF) Policy. "It was extremely interesting and enlightening to see how complex the operations are on an aircraft carrier; it is not as easy as people may perceive based on what we see from the movies." Ambassador Joseph Yun, U.S. Embassy (USEMB) in Malaysia; Mr. Iskandar Sazlan bin Mohd, principal asst. sect., MINDEF Policy; and Mr. Adi Khairulzaman bin Adi, deputy under sect., MINDEF Defense Industry, were three of the 16 guests welcomed on board. "I would like to thank [Capt. Greg Fenton, George Washington's commanding officer] for showing us what it means to have a number of initiatives in this region," said Yun. "We work together on anything that involves maritime security, search and rescue, and even trade and investment initiatives. In addition, [today's tour] showed us that the partnership [between U.S. and Malaysia] will be enriched by all of us who visited." According to Capt. John Segura, defense attaché, USEMB in Malaysia, the opportunity to bring high-level Malaysian government officials and defense industries is irreplaceable and un-replicable anywhere in the world. "What we do in 1,100 feet of sovereign U.S. territory is quite amazing," said Segura. "It is heart-warming to see the younger generations of [Sailors] out here still doing what we do even after my 31 years of naval service." 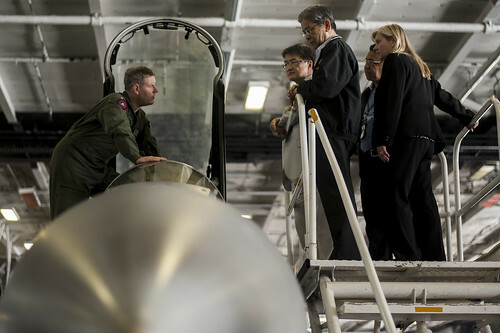 George Washington and its embarked air wing, Carrier Air Wing (CVW) 5, provide a combat-ready force that protects the collective maritime interest of the U.S. and its partners and allies in the Indo-Asia-Pacific region.